Official figures show the local authorities have spent a combined £63,130,153.50 on bringing in specialists to provide advice on a whole range of projects. The statistics, obtained through freedom of information requests, cover the 2015/16, 2016/17 and 2017/18 financial years. 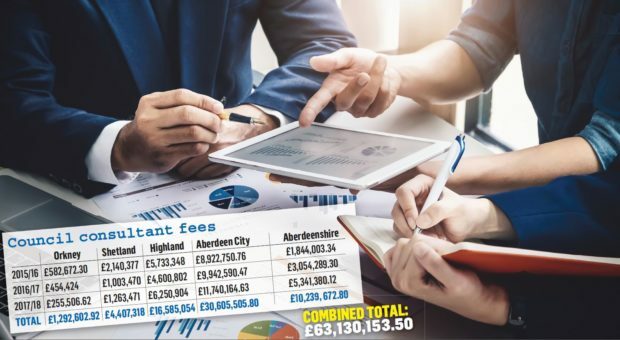 Aberdeen City Council spent more than £30million, while Highland Council paid out £16million and Aberdeenshire Council £10million. Shetland and Orkney spent more than £4million and £1million respectively. Moray Council did not respond to the FOI request. Highland Council drafted in specialist contractors, architects and engineers to help upgrade the Fort William Office, and upgrading of Inverness Castle to create a viewing platform. Consultants were brought in by Aberdeenshire Council at cost of £718,936 to help with flood alleviation studies in Stonehaven, with £35,000 spent on the Blackburn Kinnellar School build and £18,214 on advice for the Old Royal Station rebuild in Ballater. The authority – which had to make £22million of savings this year – also spent £5,000 getting advice on creating a new colour for a corporate rebrand. In Orkney, £1million was spent on various consultancy fees including for a study on inter-island transport and a survey of Scapa Flow. Aberdeen City and Shetland councils could not provide a breakdown of the projects they sought experts for. Last night, North East MSP Liam Kerr said the spending on consultants was due to budget constraints. “When a decision is made to bring in outside expertise, councils must ensure they are getting value for money” he said. SNP councillor Richard Thomson, chairman of Aberdeenshire Council’s policy and resources committee, that while figure for the region may come as a “surprise” it is only part of the overall spend. He said: “Most people will probably be surprised at this figure. However, it’s important to remember that this amounts to just over half of 1% of the council’s total spend over three years. “Following the council’s review of governance which took place under the last SNP/Labour administration, significant improvements were made to the way that councillors could scrutinise all major spending up-front, including on consultancy. A spokeswoman for Shetland Council said the local authority use consultants where certain skills cannot be delivered by their own staff and pointed out that the cost makes up less than 1% of their annual expenditure. Highland Council said the “bulk” of money going on specialists and is part of delivering their capital programme which amounts to £100million a year. Aberdeen City Council said a lot of the costs were related to specialist advice the local authority received on major infrastructure projects such as the Aberdeen Western Peripheral Route (AWPR) and the new exhibition centre. A Highland Council spokeswoman said the majority of the money spent on consultants related to the local authority’s capital plan. She said: “The bulk of the consultancy and specialist fees expenditure is in delivering a capital programme of around £100million per annum.